It’s no secret that Captain America is really just Steve Rogers in a fancy costume. And when he’s in his human persona, he’s just like everyone else – if not a little more buff after the government turned him into a super soldier. And being human like us, he needs to shower and bathe – especially after a long hard day fighting Hydra and Red Skull. And what better place to put your sore tootsies after you hose off than this plush wool and bamboo bathroom rug, made to look like the Captain’s shield by the guys at Totem Rugs. It’s guaranteed to not stop bullets from hitting your feet, but it is guaranteed to be soft and fuzzy. 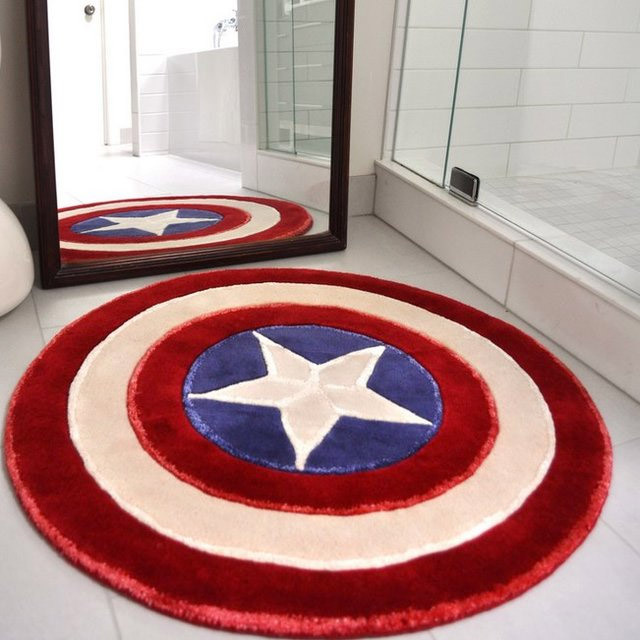 So hop on your Harley and ride over to Fancy where you can grab the Captain America shield rug for $330(USD).